Through the years, Aramco has valued and supported the people in its service less like employees and more like cherished members of an extended family. Witness the extraordinary health care services they long have offered ExPats and their families, delivered by world-class, caring medical and dental professionals at all levels. Annuitant Martin MacIntyre, Badge Number 194795, exemplifies that tradition. Martin arrived in Dhahran in 1984 with wife Rosemary and daughter Sarah (his eldest daughter Laurie was attending college). There, for the next 13 years, he served as Preventive Dentistry Coordinator, putting into practice the lessons he learned from years of public service in America. "I was eligible to retire from my position as a Commissioned Officer in the US Public Health Service," he explained recently to AXP, "and had no more challenging goals within the organization at the relatively young age of 47. It was a choice between starting a prevention-only private dental practice or seeking a challenging position overseas. Saudi Aramco offered me the position of Preventive Dentistry Coordinator for a large dental services department and a large population of over 200,000 beneficiaries, both expat and Saudi. It seemed to be worth a try, if only for a couple of years with experiencing another culture and vacation travel as great benefits." Rosemary also had a rewarding job in the Medical Services Organization where she helped to develop and then coordinate the new Executive Health Program. One of Martin’s favorite memories of life in the Kingdom concerns shopping in al Khobar. To him, the sights (the variety of people, gold and carpet stores), sounds (languages and prayer call) and smells (food) while waiting for the evening prayer to end in al Khobar’s suqs were unforgettable. "I wouldn’t call them hobbies, more like quests. 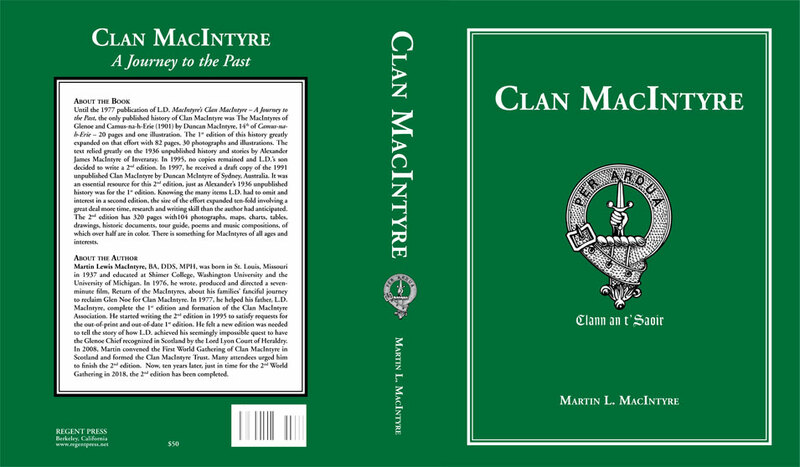 The first quest was to carry on my father’s study of Clan MacIntyre, which led to the convening of the first World Gathering in Scotland of Clan MacIntyre in 2008 and the formation of The Clan MacIntyre Trust, a charity in Scotland. This was followed by the completion of the second edition of Clan MacIntyre - A Journey to the Past in 2018. "The second quest," Martin continued, "was to rid the world of dental caries. I am a founding member of a small Internet group dedicated to this quest, using medical management of caries or SMART dentistry. I was tasked with writing a grant application to the MacArthur Foundation for $100 million and made the first cut in the competition from 1900 applications worldwide to 800. There was only one winner and, needless to say, it wasn’t our group or else you would have heard about it. Nonetheless, we are still trying and have had successful projects in Ecuador, Bolivia and Ghana. While in Saudi Arabia, I prepared three articles for publication that until now have never been published for various reasons. Better late than never, all three will be published in 2019 as part of a compendium edited by one member of the SMART dental group. "The third quest," he went on while describing his hobbies, "was to find a way for ordinary global citizens to make their views known to the governments of the world. This had been a dormant quest when I learned there was a $5 million competition for one good idea. My idea is called, The Global Human Society and, if any readers are interested in learning more, I can send a copy of my proposal via email which, needless to say, wasn’t selected either, although I think it should have been!" Since returning to the U.S., Martin and Rosemary have kept in touch with close friends from around the world they made while in Arabia, some of whom were wives who attended Hasan Al-Jana’s Arabic class. They still correspond with each other and occasionally get together for visits in the sort of intimate, highly-personalized micro-mini-reunions annuitants are famous for. "Our experience in Saudi Arabia and Saudi Aramco was one we cherish and frequently look back on as a dream vs. reality," Martin concludes. "But every day we walk on carpets and see items displayed that we acquired, so we know that the dream was real and we were truly fortunate to have been part of it." Walking on those same carpets at times are four grandchildren: Oliver Corti, age 27, (Laurie’s son); and Nora Doherty, age12, and Grace and Alice Doherty, ages 7 (Sarah’s daughters). Proud parents and grandparents, Martin reports, "After graduating Sarah Lawrence College in the Bronxville, NY, our eldest daughter, Laurie, married an Italian whom she met when taking a year of college in Italy. Laurie is currently the Italian liaison for The ROW, the high-end fashion company of the Olsen twins. Her son, Oliver Corti, is finishing his Master's Degree in public administration in Rome. "While we were in Saudi Arabia, our younger daughter, Sarah MacIntyre, graduated from Kent School in Kent, CT and Tulane University in New Orleans. She is Vice President - Asset Management for Ellis Partners, a large commercial real estate company in San Francisco." Martin and Rosemary now live in Tony Bennett’s City by the Bay, San Francisco. They invite any former friends to write them via snail-mail at 41 Temescal Terrace, San Francisco, CA 94118 USA. You can also reach Martin via email at: [email protected].